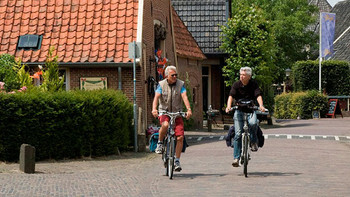 The Dutch cycle junction network makes for great, easy cycling. You can find these cycle junctions virtually all over the Netherlands. To find out more about the cycle junction network, please watch this clip. These routes are usually between 30 to 50 kilometres long and are signposted using hexagonal signs. The theme of these routes can often be deduced from their name e.g. the Molenroute (Mill route) or the Pontjesroute (Ferry route). Although there are still a number of these routes in the Netherlands, the emergence of junction routes has resulted in a steady decline of the number of themed routes with hexagonal signs. Make sure to always prepare your trip properly. After all, well begun is half done. A wide selection of cycle maps and guides will help you on your way. 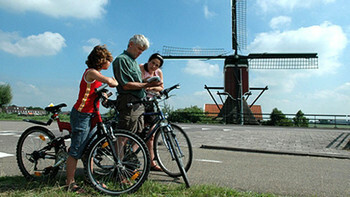 English versions are also available of Dutch guides with cycle routes in the Netherlands. Don’t have a (good) bike? Not to worry, cycle hire is available at stations and cycle shops. There may be times when taking the bike on the train would be useful. For instance, to return to your starting point. For more information about this, please check out cycle transport and repair. Before you set off on your cycle trip, you can plan your own route using our cycle route planner or a junction map. Make a note of all the junction numbers along the route, take them with you and start cycling. If you prefer using an existing route e.g. a themed route, check out the junction route overview (Overzicht van knooppuntroutes). Here, you can find themed cycle routes which are mostly based on junctions. Most routes can be downloaded immediately. The overview is in Dutch, but the accompanying map with junction numbers is very self-explanatory. In principle, you only really need the starting point and order of the junctions together with the map. 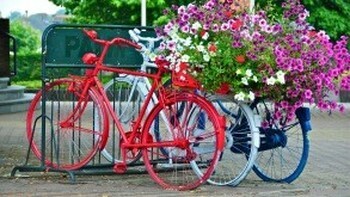 If you want, you can download the app Fietsknoop! (see instructions) which is also available in English (iPhone, Android, Windows). It helps you planning a junction route.